Essentially a smaller version of the Goshawk with a pronounced size difference between sexes. Adult male plumage is dark blue-grey upperparts with rufous cheeks, creamy buffy underparts are heavily barred with rufous on the sides of the breast and on the flanks. The male lacks the white supercilium. The adult female has slate-dark brown upperparts and creamy buffy underparts which are heavily barred. No rufous markings but does have the white supercilium. Juveniles are also heavily barred, unlike the streaking seen on juvenile goshawks. 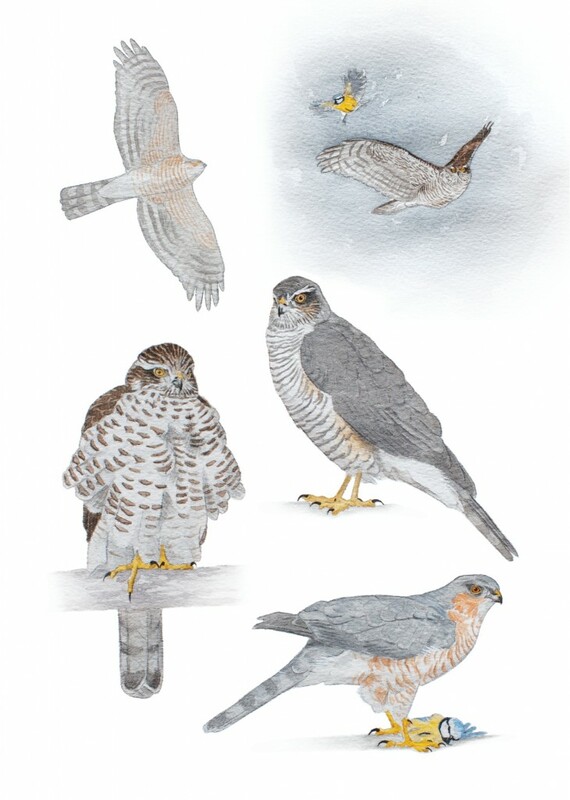 The sparrowhawk is an exceptionally agile hunter, often using hedges, woodland rides and buildings as cover to launch surprise attacks on small birds. Commonly seen hunting in woodland, farmland with woods, larger parks and rural and urban gardens. Builds stick nests in wooded areas.